Nanodrugs, or nanotechnology-based therapeutics, show great promise for treating a number of diseases, including cancer. However, an analysis of the literature from the past 10 years finds that in studies of cancer nanodrugs, a very small fraction (0.7%, median) of injected nanoparticles are delivered to the tumor. Nanodrugs are quickly absorbed by the cells of the reticuloendothelial system (RES), particularly the liver and spleen, before they can reach tumor cells. [Liu L, et al. Sci Rep 5, 10881 (2015)]. This reduces the drugs’ efficacy and also increases side-effects and toxicity. Many studies have attempted to decrease the RES uptake and to increase the tumor targeting of nanodrugs by modifying nanoparticle characteristics (e.g., size, charge, and “stealth” modification) and chemistry. Carnegie Mellon University’s Li Liu and Chien Ho developed a new strategy that targets the RES directly using Intralipid® 20 percent, a safe parenteral nutrition source that has been approved by the FDA since 1972. They tested their strategy by using nano- and micron-sized MR imaging agents, an in-development dichloro (1, 2-diaminocyclohexane) platinum (II)-loaded and hyaluronic acid polymer-coated nanodrug (DACHPt/HANP), and three FDA-approved anti-cancer nanodrugs, Abraxane®, Marqibo®, and Onivyde®. In the experiments, the animal models were treated with Intralipid® (2 g/kg, clinical dosage) intravenously 1 hour prior to and 24 hours after the injection of the nanodrugs. The researchers assessed changes in liver and kidney functions by measuring serum alanine aminotransferase (ALT) activities and creatinine levels, respectively. Tissue damage was investigated through histological examination. The researchers found that their strategy decreased the RES uptake of nanoparticles and increased their bioavailability. 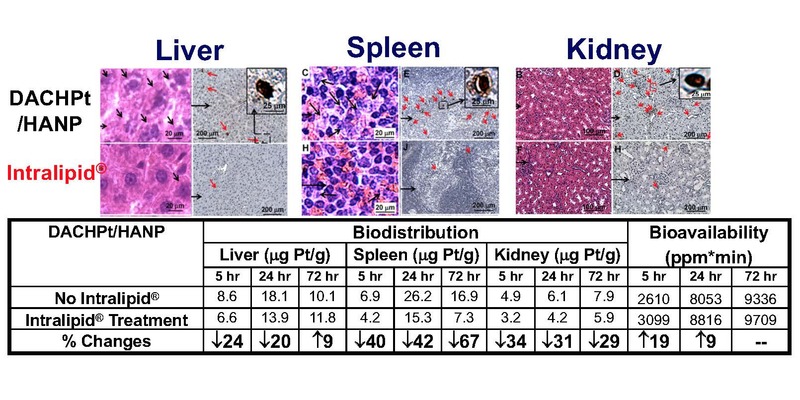 For example, Intralipid® reduced platinum accumulation in the liver, spleen, and, interestingly, kidney by 20.4 percent, 42.5 percent, and 31.2 percent respectively, 24 hours post DACHPt/HANP administration. The bioavailability of DACHPt/HANP increased by 18.7% and 9.4% during the first 5 and 24 hours, respectively (Fig. 1). The researchers also found that DACHPt/HANP, Abraxane®, Marqibo® and Onivyde® exhibit different toxicity profiles and Intralipid® can reduce their toxic side effects in the RES and kidney in different levels (Figs. 1 and 2). [Liu L, et al. Sci Rep 7, 16106 (2017)]. In a study of the effect of Intralipid® on the anti-cancer efficacy and survival rate using the experimental anti-cancer nanodrug, DACHPt/HANP, with a mouse model for colon cancer, the researchers found that Intralipid® treatment exhibited no harmful effect on tumor growth and no negative effect on the anti-tumor efficacy of the platinum-containing nanodrug and animal survival rate. Intralipid® methodology could be a valuable complement to the current cancer treatment techniques, e.g., “stealth” strategies, to reduce the RES uptake. This nanodrug delivery methodology is a general one that can be applied to any approved and in-developing nanodrugs without additional modification of the nanoparticles. 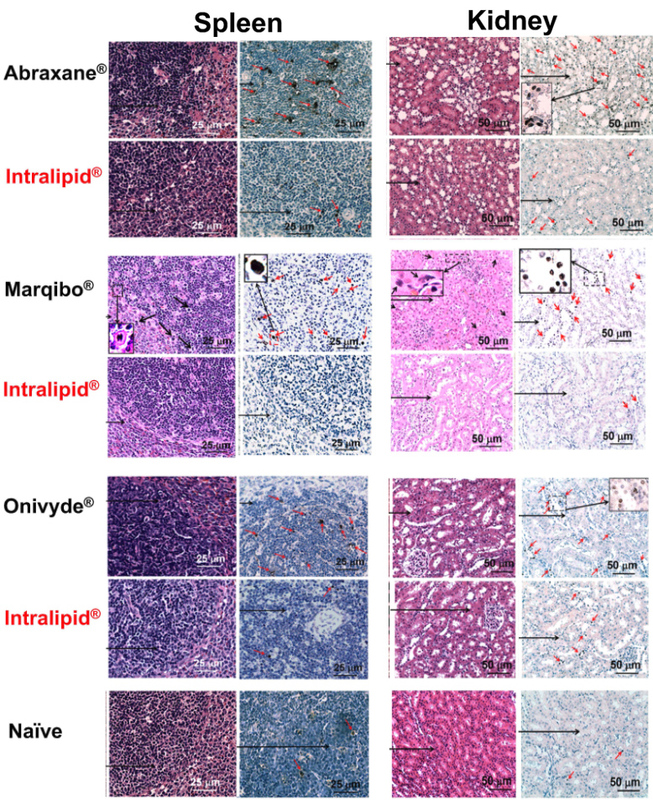 A New Approach to Deliver Anti-cancer Nanodrugs with Reduced Off-target Toxicities and Improved Efficiency by Temporarily Blunting the Reticuloendothelial System with Intralipid.